Fri, 26 Apr 2019 13:37:46 UTCCloudy, and 55 ° F. For more details? Regarding expected conduct, please remind your coaches, players, and spectators, that the referee crews are under orders to comply with a Zero Tolerance policy. If a player, coach, or spectator is acting in a manner that is detrimental to the game, and impacting others, they WILL be removed immediately and without warning. There's no place in youth sports for that behavior. Of course it is always the League's point of view and expectation that all coaches and team officials will act with the highest level of sportsmanship in everything they do and will hold their spectators to a similar level. Above all, we encourage you to talk to one another. Last year we had a significant issue because ultimately President's didn't communicate effectively, soon enough. Already this year that same thing has poked its evil little head up. Remember, if at no other time, make a special effort over the next 9 weeks to talk to one another and not take your ball and go home when things aren't working to your liking. Almost every President we talk to wants the very same things we are asking for here, but it is up to all of you to make it happen. My son’s high school football team finished 1-9 this year, and I wouldn’t be prouder of this team if they had gone undefeated. They made a game of it each Friday night, and while they often were outnumbered and overmatched, they never were outplayed. My son and his teammates have learned more about hard work, sportsmanship and resilience on the football field than anywhere else, and these lessons will make them better men. But as much as I enjoy the tradition of high school football, I worry about its future. My son’s school has nearly 2,000 students, but his team is lucky to suit up 20 players for a varsity game. There are a lot more young men who want to play, but whose parents won’t let them. Their parents think the risk of brain injury outweighs the benefits of playing. I understand the concerns and share them, but I have concluded those concerns are misplaced. My children are the most important part of my life. I am a widower, and when my son wanted to play football his freshman year, every mom and my in-laws chastised me for considering it. Even President Obama wondered whether he’d let his theoretical son play. I’m a physician and medical researcher at Stanford, and I only decided to let my son play after reviewing the medical research. The study that best elucidates the risk of football-related brain injury comes from the federal Centers for Disease Control and Prevention. CDCP officials studied 3,439 former National Football League players with at least five years of pension-credited playing seasons between 1959 and 1988. This is arguably the highest-risk group of players available for study. Among these players, the incidence of neurodegenerative disease is three times higher than in the general population. However, the risk of death from neurodegenerative disease was relatively low in both groups: 3 percent in NFL players, and 1 percent in the general population. The risk associated with a long NFL career is not insignificant but remains small. The key here is that high school football is not the NFL. The Mayo Clinic found that the risk of high school football players developing degenerative neurological diseases later in life is no greater than if they had been in the band, glee club or choir. The data suggests that the normal life of adolescents puts them at risk for brain injury all the time. What would be the alternatives to my son playing football? Sports such as soccer, skiing, rock climbing or lacrosse have similar risk profiles to high school football. My late wife rode horses competitively growing up. As an anesthesiologist at a hospital that treats more horse-related trauma accidents than any other in the country, I’m glad my son went with football. I believe the benefits of playing high school football are worth the risks. Football is an equal-opportunity sport. All different types of athletes make up a football team, the skills needed don’t require years of practice, and there is no real advantage for kids with private coaches. A healthy, average athlete who shows up to all the team’s practice sessions and attends off-season weight training can usually find a spot on the team. My son’s teammates are from the whole socioeconomic and racial spectrum. The only reason that his team was able to make a contest out of each game, despite that they had so few players to work with, is that the boys learned how to build on what they had in common instead of focusing on their differences. As Jack Kemp, the former pro quarterback and congressman, once said, “The huddle is color-blind.” In an increasingly diverse world, opportunities to learn how to work together with a wide range of people who start out on equal footing should not be lightly dismissed. When I sit in the stands, I worry when my 160-pound son lines up on the front line of the kick return team, but that is only slightly less than I worry when I sit in the passenger seat as he merges onto the highway. Adolescence is a scary time for parents. To all you parents who are keeping your sons from playing football, I say, “Let them play.” They are just as safe on the football field as they are in most of the other sports and activities we regard as a necessary part of a healthy adolescence. You can save money on expensive club sports and specialty coaches, and your sons will develop skills that will serve them and the rest of us well. Ed Riley, 56, is the younger brother of Oregon State football coach Mike Riley and is a former quarterback at Whitworth. He has two sons and a daughter. The youngest boy, Noah, is a senior quarterback at Gunn High in Palo Alto, Calif. Ed Riley works as a professor of anesthesia at Stanford University. In 2012 Finger Lakes Youth Football became a league Affiliated partner with USA Football, youth football's national governing body. While on the surface the season will look very much the way it has for the last 20 years huge changes are afoot. While coaches at all levels have had to be certified by NYSCA there was no set training standard for player safety, quality of drills, and quality of preparation. This year all FLYFCL football coaches at every level are required to become certified through USA Football by taking the only nationally accredited coaches training course. This 15 chapter course covers the fundamentals of football, safe tackling, equipment fitting, and concussion awareness, It is FLYFCL's hope that an increased emphasis on education, improved resources, and support will improve your child's experience in football and injuries will be minimized. For years our coaches have been comitted to teaching our kids about the game they love. They have always done so with passion and comittment and without pay. Unfortunately, all too often they have also done it without the highest level of support. 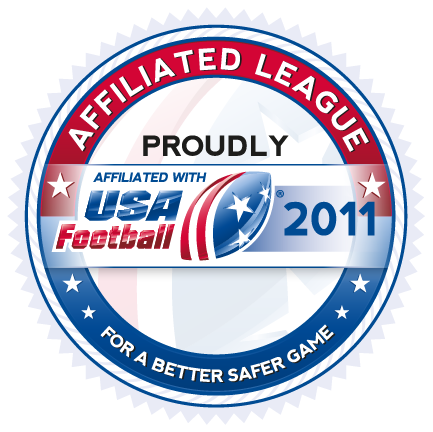 Now that that support is available through USA Football Coaching Certification, FLYFCL has taken advantage of it. When you see your player's coach, thank him or her for taking the extra time and comittment to make your player's experience and safety better than it has ever been before. Registration forms will be emailed once available!